Police in Fairfax County said Tuesday morning that a prisoner overpowered a private security guard at Inova Fairfax Hospital in Falls Church, took the guard’s gun and escaped. He was said to be driving a stolen 2002 silver Toyota Camry and was wearing a hospital gown and no shoes. The incident quickly unfolded Tuesday morning, with area residents being warned to lock their doors and not to go outside as authorities searched. The escaped prisoner is known by police as the “Bicycle Bandit” and is believed to be involved in several bank robberies in the area, escaping on a bicycle. About 7 a.m., police said the escaped prisoner allegedly carjacked a woman at Backlick Road and Cindy Lane in the Springfield, Va., area. No one was injured in the carjacking. Assaye’s mother — Hari Assaye who lives in Fairfax — said Tuesday morning that police had been to her home. She said her son had not contacted her since escaping from the hospital. She cried as she said that her son had been on drugs. She said she last talked to him last week when he was being held at a jail in Alexandria. “I told him ‘God doesn’t give up on you,’ ” she said. She said her son appeared to listen to her but didn’t say very much in response. Hari Assaye pleaded that her son turn himself in to authorities. The incident at the hospital began about 3 a.m. when Assaye was in the custody of a private security company at the hospital. Assaye was being held on federal charges for armed bank robbery, Fairfax police said. He was taken to the hospital for medical treatment after he tried to harm himself. Police said a private security company was hired to guard him at the hospital. According to the police account, a struggle ensued between the guard and Assaye inside a hospital room. Assaye overpowered the guard and took a gun. Police said one shot was fired but no one was injured. Fairfax County Police Chief Ed Roessler did not specify who fired the shot. Assaye “gained control of the gun,” Roessler said. He said two guards were watching Assaye at the time of the incident, but only one guard was involved in the struggle. Assaye has been charged with escaping federal officials in connection with fleeing the hospital, according to charging documents. Roessler said authorities are also looking for Assaye’s girlfriend. Assaye’s mother said she didn’t know her son’s girlfriend’s name. She said she believed the two lived together. Police have not released the name of his girlfriend but released a picture of her. Police said they believe Assaye is in the stolen Toyota Camry. It was not immediately clear if anyone is in the car with him. Assaye is described as being 6 feet tall and weighing 170 pounds. Police said the car he’s believed to be in has front-end damage and Virginia license plate XZP-8513. Earlier, police had put out an incorrect license plate number of XZP-8153. Fairfax police said the Toyota was reported stolen from a nearby residence. Officials in the Alexandria sheriff’s office said Assaye was booked into the William G. Truesdale Adult Detention Center in Alexandria on federal charges on March 21. 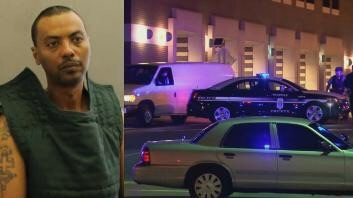 On March 27, he attempted suicide and was transported to Inova Fairfax hospital for treatment of his injuries. Under an agreement with the U.S. Marshals Service, federal prisoners are held at the Alexandria detention center, according to Amy Bertsch, a spokeswoman for the Alexandria Sheriff’s Office. Bertsch said Alexandria sheriff’s deputies remained with Assaye until Saturday afternoon and then turned custody over to security officers hired under a contract with the U.S. Marshals office. Assaye escaped from the hospital under the watch of two private security officers. Desmond Proctor, a spokesman for the U.S. Marshals, declined to comment Tuesday on the incident or discuss the agency’s policy for maintaining the custody of prisoners in medical settings. He said they expected to release a statement later today. Fairfax police said they were searching for Assaye and have a heavy presence in the area of the hospital, which is on Gallows Road. The hospital lockdown was lifted around 8 a.m. Several roads in the area were closed but have since reopened. Hospital employees during the lockdown were told to go to Falls Church High School, where a shuttle bus would pick them up. In a Twitter message, police advised those in the area to “be aware of your surroundings” and to call authorities for anyone who appeared suspicious. Assaye is suspected of being involved in a dozen bank robberies in Northern Virginia, dating back to October 2013. He is charged with just one — the March 20 robbery of Apple Federal Credit Union on Sir Viceroy Drive in the Alexandria section of Fairfax County — but investigators believe 11 others bear striking similarities. The agents arrested Assaye when he returned to his father’s apartment that afternoon. He was initially charged with a weapons offense, though that charge was dropped and he was instead charged with bank robbery on March 25. Agents said they found $1,600 in a zipper purse in his left jacket pocket.